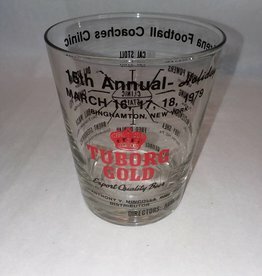 1979, Collectible 15th Annual Arena Football Coaches Clinic glass, Holiday Inn, Binghamton, NY. Bill Walsh, SF 49ers & Charlie Pell, Florida, 2 of 10 Coaches listed. Advertising Tuborg Gold Beer. Excellent condition. 14 Oz. 4.5" tall.